How epic are these Bollywood blockbusters? Opulent sets, breathtaking visuals and gorgeous costumes. 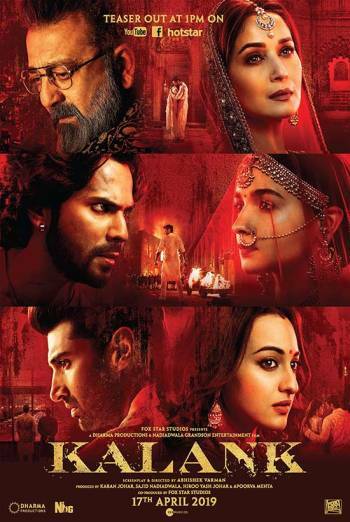 Kalank hits Vue on 17 April and it’s a pretty big deal. A sweeping, big budget period drama, it’s up there with some of Bollywood’s most lavish films - and Bollywood does lavish pretty spectacularly. So we asked Sharan Dhaliwal, Editor-In-Chief of South Asian lifestyle magazine Burnt Roti, to talk us through some of the most epic Bollywood films of all time. Bollywood has offered their next epic period drama in the form of Kalank, a tale of love triangles and revenge set in the 1940s. In an emotional Instagram post, renowned producer Karan Johar revealed that the film was 15 years in the making and had been something of a ‘dream project’ for his late father, the legendary filmmaker Yash Johar. It was in fact the last film his father worked on before his death in 2004. This was the film that put Sanjay Leela Bhansali on the map as the go-to director for epic dramas. A romance set in early 1900s, it charts a man’s descent into alcoholism when he can’t marry his childhood love. Looking back, conversations about Shah Rukh Khan’s character essentially being a man-baby became almost as enjoyable as the set design. Another Sanjay Leela Bhansali hit, Bajirao Mastani is about the story of a warrior ‘king’ who marries his love, meets another woman and marries her too. It’s Devdas x10 - the sets are bigger and better, the songs are catchier and the choreography more intricate. We watch Ranveer Singh being wooed by both his wives, played by Priyanka Chopra and Deepika Padukone. A young, indulgent prince is sent to battle by his father in order to learn discipline. He soon returns as a suave and defined man and quickly falls in love with a court dancer - but his father disapproves and imprisons her. It was this film that many considered marked Madhubala as an extraordinary actor - her health had deteriorated, but she was unrelenting in her performance. Rekha stars as Umrao Jaan in one of the few films that follows a courtesan’s life - from being taken from her family to learning how to dance and essentially captivate men for money. Extraordinarily, a lot of the costumes worn by Rekha were her own, proving she always was the fashion queen we now know and love. Not in the same vein as the others (but a period drama nonetheless), Lagaan tells the story of the suffocating rule of the British Raj as they attempt to stifle a village. Through a game of cricket, the village wins back hope. The first cut of this film was over 7 hours long.